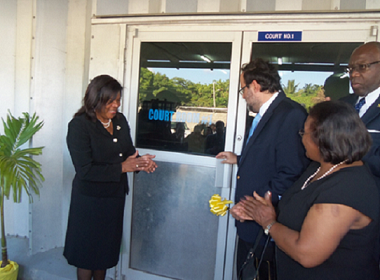 Chief Justice, the Hon Mrs. Justice Zaila McCalla (left) looks on after the cutting of the ribbon, to officially open the Morant Bay Court House in St. Thomas on July 31 by Minister of Justice, Senator the Hon. Mark Golding (2nd left). Looking on are: Minister of Health and Member of Parliament for Eastern St. Thomas, Hon. Dr. FentonFerguson; and former Minister of Justice, Dorothy Lightbourne. 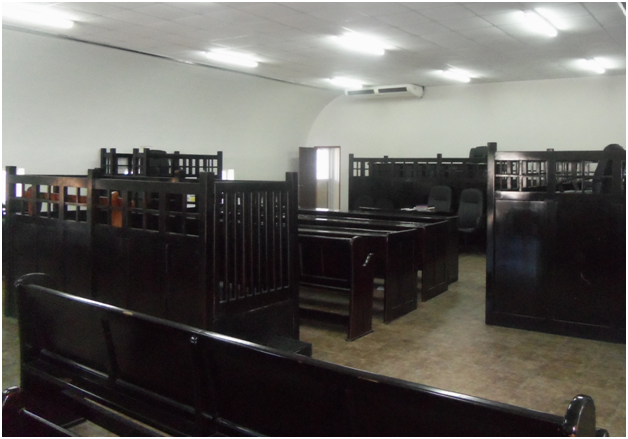 One of the court rooms at the new Morant Bay Court House. The new Morant Bay Court House in St. Thomas, constructed by the Government at a cost of $45 million, was officially handed over to Chief Justice, Zaila McCalla on Thursday, July 31, by Justice Minister, Hon. Mark Golding. Located at 16 Church Street, the new building replaces the historic court house that was destroyed by fire in February 2007. Since the fire, matters before the St. Thomas Circuit Court have been heard in Kingston, while the Cedar Valley and Yallahs court houses were used as temporary locations for the Resident Magistrate sessions. “Today, we are not only handing over this facility to the Chief Justice and the administrators of the court, but to the people of St. Thomas and its environs whom it will serve,” Senator Golding said in his address at the handing over ceremony. He gave the Government’s commitment to ensuring that all citizens have access to facilities that are suitable for the administration of justice. Senator Golding also used the opportunity to appeal to citizens to take responsibility for the care and maintenance of institutions such as courts, police stations, schools and health facilities. Justice McCalla, in expressing gratitude for the long awaited court house, stated that the destruction of the previous facility presented numerous challenges for litigants, attorneys-at-law and court staff. She noted that the physical amenities have been designed to ensure the comfort of the users of the building as well as to improve the administration of justice. Mayor of St. Thomas, Ludlow Mathison, who brought greetings, noted that the handing over ceremony is a symbol that “justice lives on”. “I am pleased that this event is happening at a time when St. Thomas is experiencing a fall in serious crimes, especially murder,” he stated. The 9,013 square-foot building includes two courtrooms with jury boxes, two judges’ chambers, a registry, clerk’s office, jury room, witness room, lunch room, sick bay, holding area with police post, public sanitary facilities, and a 40 feet container for storage of files and accommodation for the bailiff. It meets a number of safety and security standards and is designed to withstand hurricane force winds of up to 74 metres per second.